Close view of carved doorway in public garden, Narsimhapur. bl.uk > Online Gallery Home	> Online exhibitions	> Asia, Pacific and Africa Collections	> Close view of carved doorway in public garden, Narsimhapur. 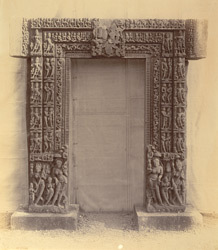 Photograph of a carved doorway in the public garden at Narhimsapur taken by Henry Cousens c. 1892-94 from the Archaeological Survey of India Collections (Indian Museum Series). Shortly after this view was taken Cousens wrote in the 'Central Provinces List of Antiquarian Remains': "In the public garden...there are some very interesting sculptures which were collected by Colonel Bloomfield from various parts of the district. Most of them were brought from Barehta. They shew (sic) that there once existed in this district a high class of old temples...The sculptures in the garden consist of pillars, doorways, portions of the same, beams, and figures, together with some old guns. Most interesting of all, perhaps, is a very complete and elaborately carved doorway which is set up across a pathway [seen in background of this print], and is, with the exception of the dedicatory block upon the lintel, in a thorough good state of preservation...."